Barnes & Noble has been relegated to a lower status in the tablet/e-reader market, but it has always put up a respectable showing considering its main rival is the insanely popular Amazon Kindle Fire. But, a new report says that Barnes & Noble may "move away" from the Nook hardware and focus on other parts of its business. The report comes from the New York Times, and says that while B&N may not be "completely getting out of the hardware business", the execs are looking to scale back the effort that the company is putting into the Nook. Instead, the company may look to focus on offering content on other platforms. This could mean pushing the Nook app to try to compete with Kindle. The Nook division of B&N has been losing money, so it's not that much of a surprise. No formal announcement has been made, but there is a chance we could see the bookstore division be split from the Nook division and college bookstore division, because B&N chairman Leonard Riggio may make a bid to buy the bookstore division outright. This isn't surprising. With the iPad leading the way in the tablet market and the Kindle leading the way in the eBook readers market and doing quite well with the Fire series, it's no surprised BN want to do away with the Nook. I don't think this article has anything to do with Apple. I mentioned the iPad, not Apple. Mxyzptlk brought up how the iPad and Kindle Fire dominate the tablet industry and you guys have to start some Hate Apple banter -_-' The iPad does dominate the tablet market with the Kindle Fire in 2nd place. Get over it. Id rather see the Surface or the Samsung Ativ in first place but ill admit the iPad has many appealing features and qualities. Apple is the company as a whole. The iPad is just one device. You're digging the hole even deeper. Too bad. 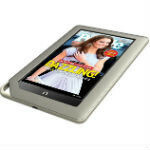 In 2011 I got the Nook Tablet with 1GB of ram for my mom as she is a avid reader and she loves it. Considering how much real estate of the brick and mortar stores they take up with the Nook it kind of seems to me like a huge step back in the wrong direction. Instead they should focus on the app for phones and building a better ink ereader than tablet. The one saving grace that could really save them is a free digital copy of any book you buy in the store or online. This would drive up their book sells and get people to use the app/nook more.